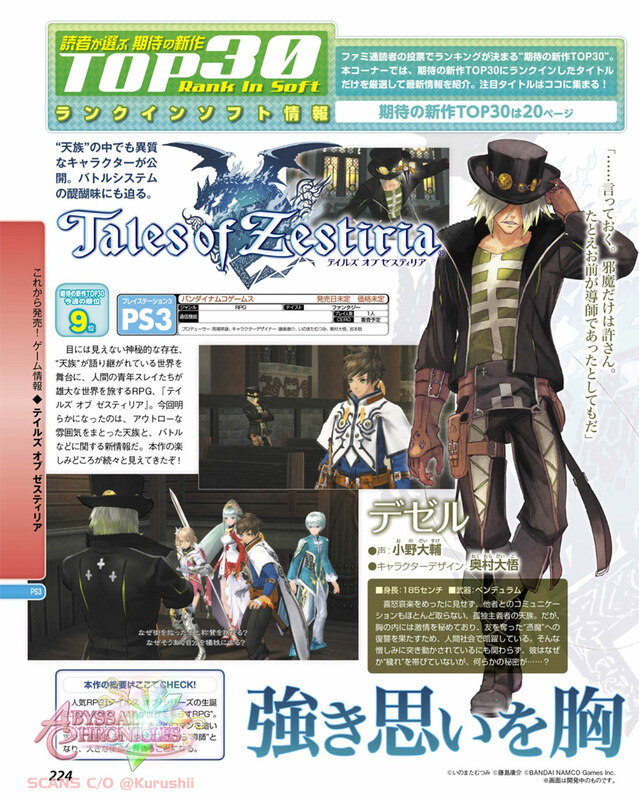 Here's more info on Tales of Zestiria's new character Dezel, plus some more tidbits on the game's battle system and story from Famitsu Magazine. "Let me tell you. I won't let you get in my way. Whether you're the Priest or whoever." A Divine with an isolated nature who rarely shows emotions and mostly doesn't communicate with others. Within him, he hides great fury when his friend was taken from him. He hides himself in the shadows of human society in order to find the culprit and avenge his friend. Despite being driven by such hatred, he is unaffected and hasn't fallen to impurity. Is there some secret behind it? 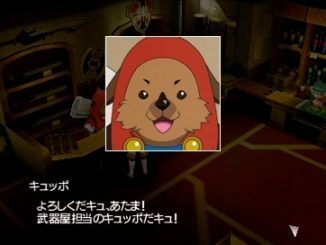 Remember that in the world of Tales of Zestiria, those with impure, criminal thoughts bring forth the monsters in the game. Dezel, however, does not bring forth that phenomenon despite his motives. This could be because he is a Divine, or it could be something else. The new battle system, the Fusionic Chain Linear Motion Battle System or FusionicChain-LMBS for short, makes use of the contrasting battle styles between humans and the Divine. 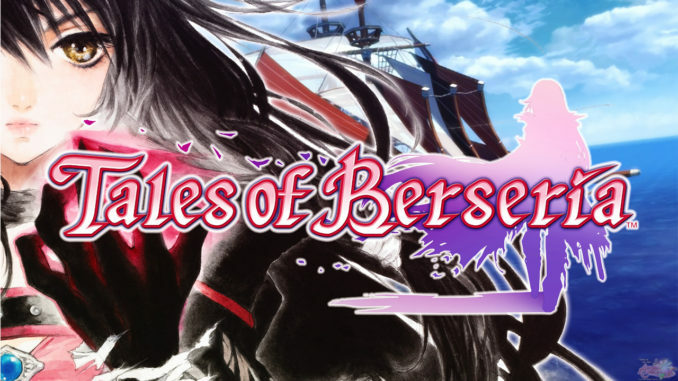 As a rough translation, humans have Base Artes and Arcane Artes, while the Divine have Base Artes and Divine Artes (basically Spell Artes in other games, I believe). Though their abilities differ, they consume identical gauges. 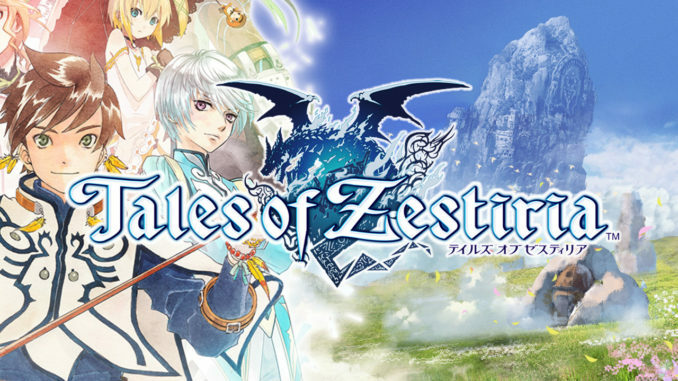 In addition, the popular Around Step feature from Tales of Graces is also in the game in order to deliver an exhilirating experience. Around Step: Like in Graces, Around Step lets you swiftly move left and right an enemy in a circumferential way. For example, should an enemy be targeting you and you're in its line of attack, you can utilize the Around Step feature to quickly dodge the attack by moving either left or right of the enemy. 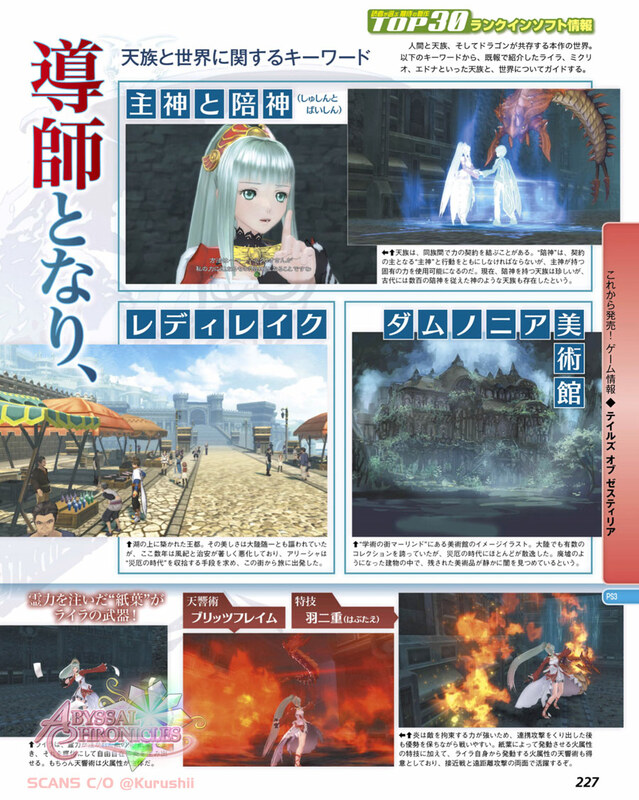 In Zestiria, using Around Step with good timing will allow for a Support Evade, which will deal 1 damage to you, but will help fill up for the Spirits Chain and will also stagger the enemy. 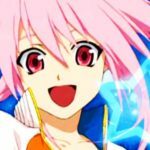 Blast Gauge: This is the number next to a character's HP and SC bars. Defending and evading allows filling up of the Blast Gauge. Using the filled Blast Gauge allows various effects such as blowing the enemy away, as well as increase the effectiveness of attack and defense, especially in combos. Depending on your timing, the Blast Gauge may have different effects, allowing for different strategies to be applied. 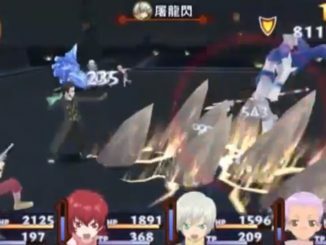 Spirits Chain: This is the blue gauge below the red HP bar. 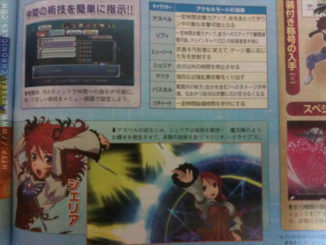 The use of attacks and artes by characters, as well as the strength of said moves, are determined by the consumption of Spirits Chain. 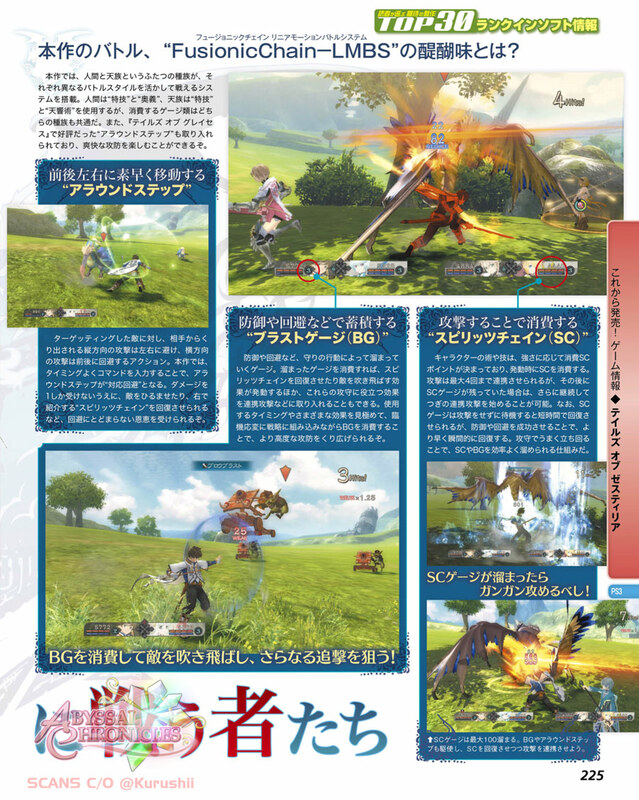 The game allows for a max of 4 basic attacks to be linked, after which, should there still be remaining points in the SC gauge, more attacks and artes can be connected afterward. The SC gauge needs a short time interval in order to recover points, but having successful defenses and evasions from enemy attacks fills up the gauge much faster via the Blast Gauge. Spirits Chain seems to be more like TP with a mix of CC/AC features in this regard, but we're not sure at the moment unless we actually see it in action. The game allows a maximum amount of 100 for the Spirits Chain gauge, though it doesn't mention exactly how it'll reach that amount. Literally "Chief Gods" and "Accompanying Gods." The Divine are also able to form contracts with other Divine. In this regard, though the Baishin must act in accordance with the Shushin who acts as the master of the contract, the Baishin will have the possibility to use the Shushin's powers. In the present times, a Divine with Baishin are rare, though hundreds of years ago there was a Divine that the Baishin considered as a God, and this phenomena was more common. 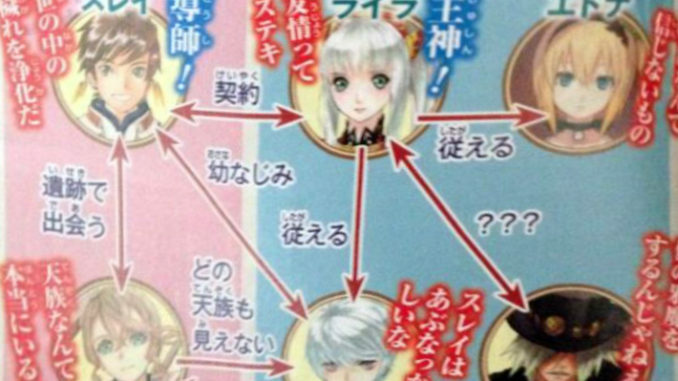 Based on dialogue in the scans as well as the relationship chart, it seems Lyla will be come a Shushin to Mikulio and Edna, who will both become her Baishin. Within the brilliant royal palace lurks dark suspicion. The last Priest has long gone, and at present, the Tale of the Priest is nothing more than an old legend, a fairy tale even, but in the hearts of the masses still remain a latent worship for the him. Since long ago, his existence has been a problem for those in political power. Once the royal chancellors discover that Slay has just become a Priest and Alicia is in good terms with him, they start being vigilant about Slay and even summon the two to the royal palace. Here, he gets to experience the other side of human society, in a place where one cannot avoid having the Priest experience the impurities of mankind. Between Alicia's bitter standpoint as a knight princess with the lowest rank, and the expectations of the royal chancellors who hold the true political power, what would Slay think? As the Divine of Wind, Dezel has the ability to perform precise attacks by manipulating the atmosphere in his surroundings. And since he's been living as a mercenary for humans for a long time now, he is also equipped with good fighting skills with his pendulum. He uses it as a medium of his spiritual powers, thereby manipulating it with wind. He has artes good for horizontal and vertical lines of aim, and is able to hit enemies in one haul. It can also act as a whip. The Divine of Fire, Lyla, on the other hand, uses paper pages as her weapon, wherein she incorporates her spiritual power into, allowing her to freely form flames on whim. Of course, her Divine Artes are of the fire element, as well. By utilizing her paper pages in casting Artes, she can bring forth fire damage from all sides, and either short range or long range. 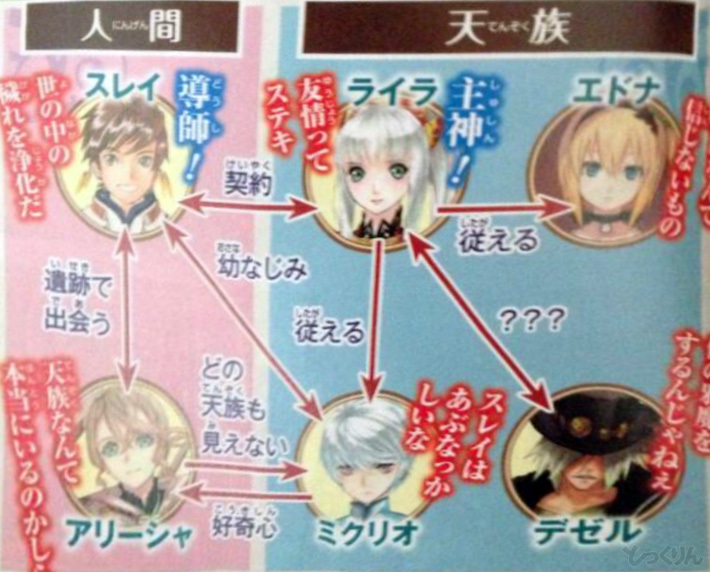 Another scan features a sort of relationship chart between the characters so far. The pink background represents humans, while the blue one represents the Divine. 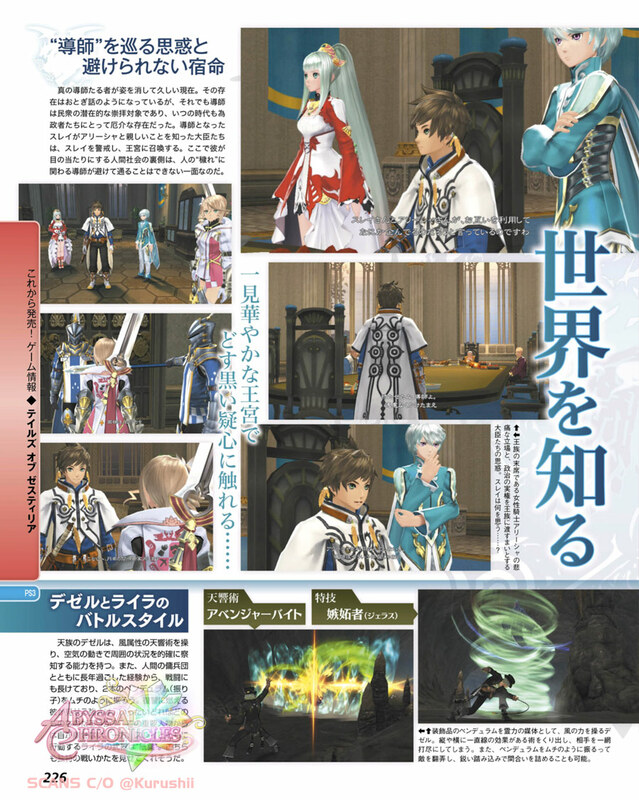 You can check out Famitsu for some screenshots of the game. Many thanks to @Kurushii for the scans.